We're only a few days away from the month of February y'all and I am having a really hard time wrapping my head around that. This past Sunday marked exactly 6 months until I turn 29 (also marked 11 months until Christmas. Not that I'm counting...). Kristie and I both have July birthdays and were just discussing how crazy it is that were only 6 months away from another birthday. Time is just flying by. 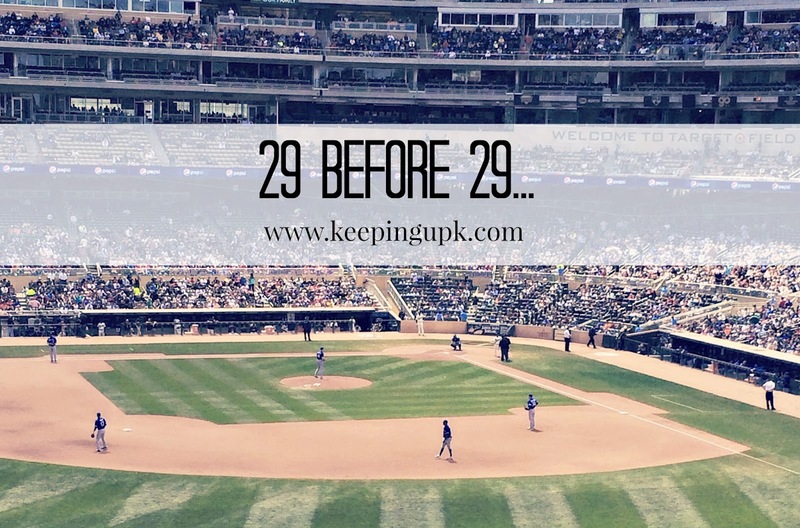 Last year I created a 28 Before 28 list for myself and pretty much forgot all about it (whooops). I did the exact same thing with my 30 Before 30 list the first year after I made it. I really should have created my 28 Before 28 list the day after my birthday, not 6 months later, to give myself a little more time but it is what it is. 2015 was a year of so many ups and downs and was also one of the busiest years of my life! My brother and sister in law got married (definitely the highlight of the year but definitely accounted for most of the busy-ness! ), I traveled to Vegas with two of my best friends to celebrate my sisters Dirty Thirty, and I spent an epic weekend in Minneapolis watching the Blue Jays with my brother and sister in law and fell in love with baseball - just to name a few things. But it was also the year that brought us my Mama's cancer diagnosis (something I haven't talked about yet on this blog because writing out that word is just so scary) and that brought so many fears and doubts. I'll talk more about it when I finally complete my 2015 review but my Mama is doing good and we're just taking things day by day and week by week so it gives me a little bit of relief that 2016 can be a good year for me and my family. I was more than ready for 2016 for a fresh start, especially since I have so many financial goals for myself for the first half of this year that I am ready to crush. Since I have a lot of financial goals for this year and have created a pretty strict budget for myself for the first 6 months of this year I've mostly came up with things that won't cost a lot (or that I have already factored into the budget) so I'm confident that I can cross these off before July 24th. I'm also going to print the list off and keep it by my desk at home so that there is no way I can forget about them! This is such a great idea and something that I will have to try to remember to do come my birthday in August (I don't want to lose out on 5 months!). Or perhaps I'll just do a "30 Before 30" and give myself a few years to get it all finished. I would love to attends a "Favourites Thing" party - I've always had the idea of hosting one floating around in my head. Also, getting braces off is the best feeling ever, so I hope you can achieve that goal before your birthday! Looking forward to seeing how well you do with your goals! Being comfortable in a swimsuit is something I definitely want too. I'd also love to host a favorite things party--those seem like so much fun! yay to all the things! good luck with saving and getting your braces off. also to being comfortable in a bathing suit..that's more mental than anything, but you can absolutely do it! just don't tie it to the weight loss, you know? like once i reach x, i'll be comfortable. you can do it without reaching x ;) and yoga teacher training, how exciting!!! Great list! I think you can totally nail this! I still have learning to use my camera out of auto mode on my to do list too. And I'd love to spend a whole check at Target!